Cory Turner drives his No.97 Sprint Car at Ohsweken Speedway on Friday, June 8. (Photo by Dale Calnan/Image Factor Media). CAISTOR CENTRE, Ont. – June 12, 2018 – Cory Turner continued his strong start to the Ohsweken Speedway season when he earned his fourth-straight podium finish to start the season on Friday, June 8. 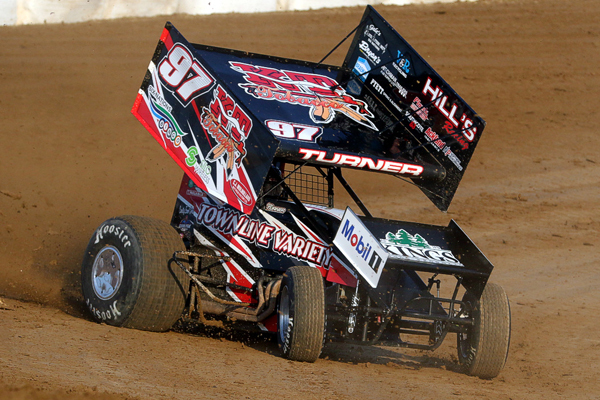 Turner claimed a third-place finish aboard his KT Tobacco/Silo Wireless No.97 Sprint Car after starting eighth for the 20-lap Feature event. The night started with a sixth-place time in hot laps and Turner felt comfortable with the car knowing he had the pole starting spot for the third heat of the night. With the top position came some added pressure as Ohsweken’s passing points systems penalizes drivers who finish below their starting position. Turner qualified into the redraw and was the seventh driver to pull a number when he selected eighth, the highest starting position available to the redraw drivers. Turner, however, looked at the situation positively, knowing he would likely be able to gain some speed off the initial start in the outside groove. After a couple of red flags early in the race, Turner used a mid-race restart to challenge leader Dylan Westbrook with a couple of slide jobs in a bid for the lead. Over the final five laps, Turner’s car got progressively tight, which caused him to slip over the banking in turns three and four with two laps to go and fall to his eventual finishing position in third. Turner will be back in action at Ohsweken on Friday, June 15 for Wall of Fame and the Kids Race for the Canadian National Autism Foundation night. For additional event information, visit www.ohswekenspeedway.ca. Error: Error validating access token: Session has expired on Wednesday, 26-Sep-18 21:50:24 PDT. The current time is Wednesday, 24-Apr-19 20:49:48 PDT.